Tampa Bay scored a double play after Ron Kulpa ruled Red Sox batter David Ortiz interfered with a catcher's attempted throw to second base, having himself struck out swinging on a 2-2 fastball. The Play: With one out, one on (R1), and a 2-2 count, Red Sox batter David Ortiz swung at and missed a 93-mph fastball from Rays pitcher Brad Boxberger while Red Sox baserunner R1 Xander Bogaerts attempted to steal second base. Replays indicate this pitch was then caught by Rays catcher Bobby Wilson, who appeared poised to throw to second base and make a play on R1 Bogaerts, until B1 Ortiz's bat made contact with Wilson's helmet, effectively ending the catcher's throwing attempt. HP Umpire Ron Kulpa thereafter ruled Bogaerts out for Ortiz's interference and Ortiz out on the third strike. Question: Given the aforementioned play, what is the proper call for each of the following scenarios? (A) Call the play as is (one out, R1, 2-2); was Kulpa's ruling correct? (C) All else equal, there were two outs and the third strike was dropped (two outs, R1, 2-2, Dropped 3K). Note: Part (C) calls for consideration of backswing contact so that F2 Wilson can't make any play. Solution: The solution to this play, at the professional level, is archived at this very website from an odd Replay Review from July 5, 2014 featuring plate umpire Mike DiMuro and an overturned call at second base. In that play, DiMuro ruled the batter's backswing on a swinging third strike unintentionally struck the catcher as R1 tried stealing second base. 2B Umpire Jerry Layne initially ruled R1 out, so DiMuro's call was waived, but after a challenge that reversed Layne's call to "safe," DiMuro properly reinstated his backswing ruling and ordered the now-safe R1 back to first base as a result of the dead ball. 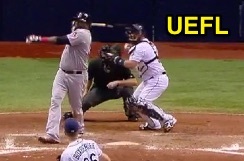 B1, naturally, was out on the third strike. KEY POINT: "Backswing interference" is a misnomer: Unintentional backswing contact is not interference. (A) If the ruling is that Ortiz deliberately interfered, then a double play as the result of interference is correct. If the ruling is solely that Ortiz's forceful backswing unintentionally hit the catcher, the proper call is a dead ball strike, since follow through/backswing contact is not interference in OBR. Ortiz is out, but R1 Bogaerts is returned to first base with two out. (B) Same as [A], except that Ortiz inherits a 2-2 count (unless he is called for "true" interference by stepping across home plate, deliberately hitting F2 with the bat, or for some other action). (C) The inning is over and Ortiz is out, as the ball becomes dead as soon as his backswing unintentionally hits the ball. Unfortunately for the batter, this dead ball occurs during his third strike. NOTE ABOUT RULES DIFFERENCE IN HIGH SCHOOL: Under NFHS rules, Scenario (A) results in a double play, since the follow-through contact is interference in high school (assuming R1 could have been thrown out). In NCAA/college, however, it is not interference: "on a third strike, the ball is dead; the batter is out." Oddly enough, PBUC has the exact same interpretation as NCAA ("on a third strike, the ball is dead and the batter is out"). In other words, backswing (which occurs pre-pitch) or follow-through (which occurs post-pitch) contact is interference in high school, but not in college or pro. Because of this difference, the runner is out in high school for the follow-through interference of his recently-retired teammate (e.g., B1), but not in college/pro, because in college/pro, the just-retired B1 did not commit interference, since backswing contact with the catcher is not true interference. OBR 5.09(a)(2): "A batter is out when—A third strike is legally caught by the catcher." OBR 6.03(a)(3) Comment: "If the batter interferes with the catcher, the plate umpire shall call 'interference.' The batter is out and the ball dead. No player may advance on such interference (offensive interference) and all runners must return to the last base that was, in the judgment of the umpire, legally touched at the time of the interference. If, however, the catcher makes a play and the runner attempting to advance is put out, it is to be assumed there was no actual interference and that runner is out—not the batter. Any other runners on the base at the time may advance as the ruling is that there is no actual interference if a runner is retired. In that case play proceeds just as if no violation had been called. If a batter strikes at a ball and misses and swings so hard he carries the bat all the way around and, in the umpire’s judgment, unintentionally hits the catcher or the ball in back of him on the backswing, it shall be called a strike only (not interference). The ball will be dead, however, and no runner shall advance on the play."